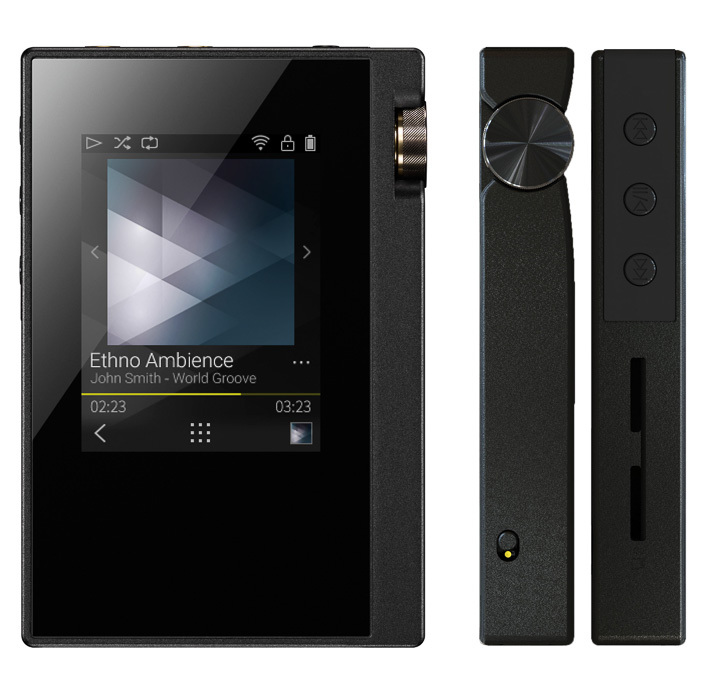 The Onkyo DP-S1 is the second of two collaborative digital audio players between the brand and its stablemate Pioneer. The first pairing – the Onkyo DP-X1 and Pioneer XDP-100R – were larger, Android-based players originally introduced about 18 months ago. The new Onkyo DP-S1 shares its platform with Pioneer’s XDP-30R. The difference between the generations is simple. The first generation models were larger, more expensive, and Android-based. The new models are smaller, cheaper, and use the company’s new custom-designed Linux operating system. The differences between the Pioneer and Onkyo models are the same, too: in both cases, the Onkyo model sports uprated components (like thin-film capacitors) in the signal path and its voicing is said to be less ‘peaky’ and more in line with audiophile requirements. In addition, the slightly cheaper Pioneer is destined to be sold through more mass-market vendors, where the Onkyo is available from more specialist audio retailers. There is also a very slight stylistic difference (the bottom right corner is lopped off in the Pioneer model). In many parts of the world, the Onkyo DP-S1 is also known as the DP‑S1 Rubato (the Pioneer has its own suffix – the XDP-30R Private – which sounds either militaristic or a bit pervy). The word ‘Rubato’ is a musical term for the expressive rhythmic freedom within passages of a composition, without changing the strict tempo or even pace of the whole composition. It’s derived from the Italian word rubare or ‘to rob’, which might not be the best choice of words when faced with an extremely attractive, small, light, portable, and inherently ‘nickable’ piece of equipment. So, we’ll stick with DP-S1, thanks. The core of the Onkyo DP-S1 is a twin-DAC arrangement of ESS9018C2M SABRE DACs coupled with twin ES9601K amplifier chips, laid out symmetrically and each served by its own power feed from separate capacitors. To take full advantage of this twin converter arrangement, you need to use the DP-S1 in balanced mode, eschewing the regular 3.5mm headphone jack for a 2.5mm four-pole balanced audio mini-jack connector. You can’t use both at the same time. In balanced mode, you can run as standard with a slightly higher output, or what the manual refers to as ‘ACG’ mode, where the grounding is more forcibly fixed. This leaves the output level identical to that of single-ended. You can also turn the 3.5mm jack into a line-level output. There is 16GB of onboard storage, supplemented by up to almost half a terabyte if you bulk up with large capacity cards in both micro-SD card slots, and a micro USB connector for connection to a computer or for charging. Software updates can be sent down the USB connector, or loaded to micro-SD. Operation is by a combination of hard buttons for power, basic track handling, a thumb-wheel volume control, a button to prevent accidentally using the DP-S1 while in pocket, and a touch-screen for everything else. The touch-screen is small (2.4in), straightforward in use, the overall user interface is a classic (as in ‘it’s easy to use, but the combination of hierarchical menu structure and its overall looks make it seem like it was designed a dozen years ago’), and ‘gives good haptics’ in that operation is largely intuitive, and the screen is relatively responsive. The overall feel of the DAP is good, too, although the DP-S1 cries out to be used with one of its cases because the crackle-finish back panel is perhaps the only part of the DAP that looks and feels a little cheap.